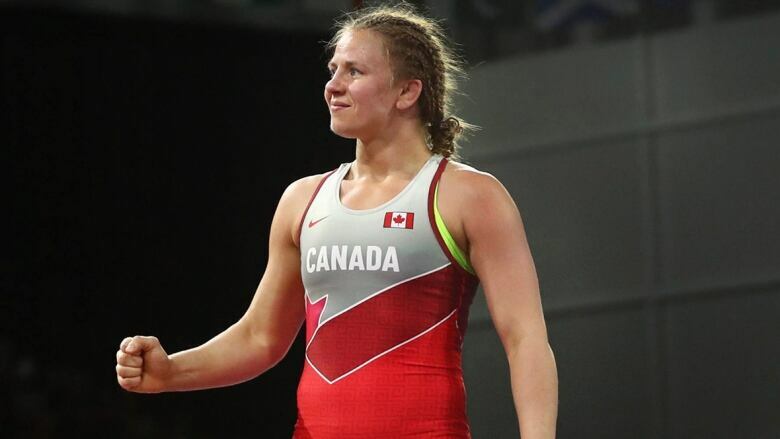 Canadian wrestler Erica Wiebe was named flag-bearer for the closing ceremony of the 2018 Commonwealth Games in Gold Coast, Australia. "I am incredibly honoured to be named flag-bearer," the 28-year-old from Stittsville, Ont., said in a press release. "It feels surreal and I can only imagine the moment I will put the Canadian flag in my hand and walk into the stadium. It's an honour that an athlete only dreams of." Wiebe's medal is one of Canada's 15 golds at these Games; Canadians have won 81 medals over 10 days of competition so far and set a goal of winning 100 before the Games end on Sunday. "To win the 2014 Commonwealth Games, then the 2016 Olympic Games, and repeat again as Commonwealth champion is an amazing achievement," said Canadian Chef de Mission Claire Carver-Dias. "With her unquenchable energy and love of the Commonwealth sport movement, Erica embodies the true spirit of Canada's amazing athletes." The closing ceremony will be streamed on CBCSports.ca at 6:30 a.m. ET on Sunday. There will be an encore stream at 6 p.m. ET as well. When the call came, Wiebe thought she might be in trouble.The word from Wrestling Canada's executive director was to report immediately to the Canada office at the athletes village. "We turned the corner and the chef de mission for Team Canada [Claire Carver-Dias], the assistant chef [Benoit Huot] were both there and I instantly was like "Oh maybe it's not so bad. I didn't get too crazy last night,"' Wiebe said with a laugh. Wiebe said carrying the flag will be special. "It'll be emotional for sure," she said. "After I heard the news earlier (Saturday), I was kind of thinking about what it would be like to hold the flag in my hands, hold the pole in my hands for the first time. It'll be really interesting to have that experience and to walk into that stadium and be representing all that Team Canada embodies." Wiebe is only the second wrestler to carry the flag into the Commonwealth Games ceremony; Daniel Igali acted as flag-bearer for the opening ceremony of the 2002 games in Manchester.